"The standard by which other winter guidebooks are judged." Two books in one! This 355-page book is the bible of cross-country skiing, snowshoeing, snowboarding and backcountry skiing in Idaho, the Tetons and Yellowstone National Parks. 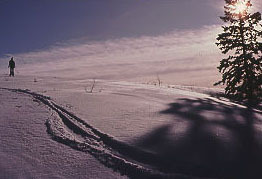 It includes descriptions of hundreds of cross-country ski and snowshoe trails. 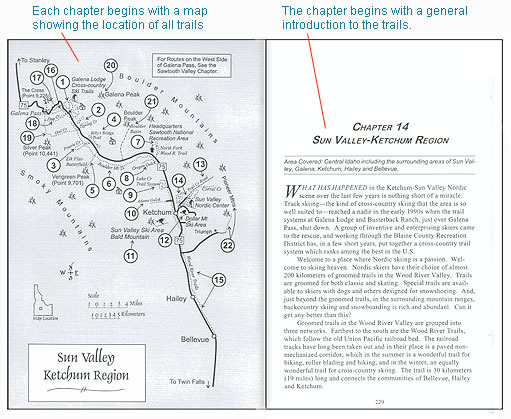 Backcountry aficionados will also find it invaluable with beautifully done aerial illustrations detailing snowboard and backcountry ski routes in some of the best terrain in the west. 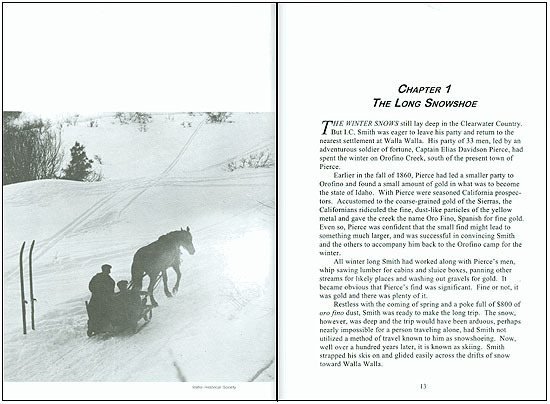 And the book is filled with stories, honoring and retracing the rich traditions of western winter travel. To top it off, it has been carefully and lovingly designed which is obvious by its pleasing graphics, easy-to-use maps, enticing photography, and overall visual appeal. "It has a well honed sense of place, a nice appreciation for local folklore and a commitment to sport that is integrated with the environment." We (Great Rift Press) are the publisher, and most importantly, we have the books in stock. We ship as soon as we get your order. Amazon and other on-line book dealers do not stock the books, and it may take several weeks before you receive your order. Additionally, our shipping charges are lower than other on-line suppliers. One last bonus: if you order a new book, we'll have it signed for you. Just tell us to whom you want the book signed. 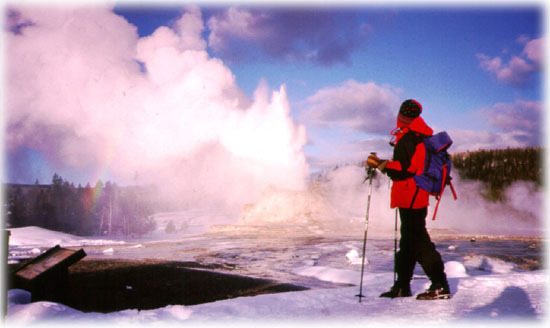 Winter Tales and Trails is a guidebook to cross-country skiing, snowshoeing, snowboarding and backcountry skiing in Idaho, the Tetons and Yellowstone National Parks. 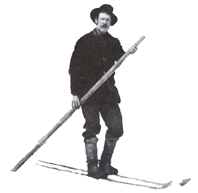 It includes hundreds of cross-country ski and snowshoe trails, details on routes for dozens of backcountry skiing and snowboarding excursions, and loads of stories about the history of skiing and winter travel in the west. 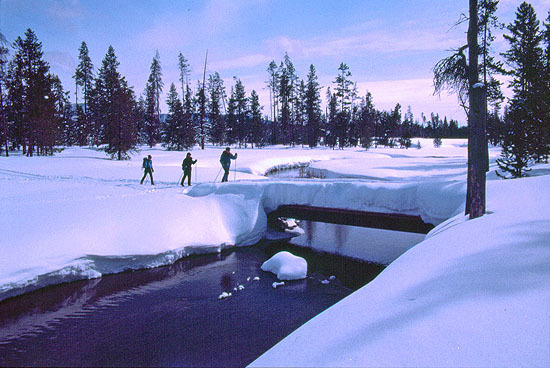 For over 20 years, the author, Ron Watters, has been exploring, writing, and collecting information about winter recreation in this beautiful corner of the west. He knows his topic, and he knows how to strike a balance, including information on easy-going and safe trails for beginners and families as well as challenging areas for experienced backcountry users. Moreover, he is a wonderful story teller, drawing from his own experiences and from those of long ago. 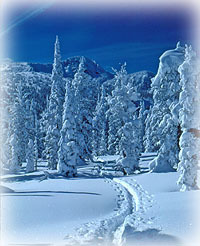 It's a lively, fun and informative book and a must for anyone who loves the western winter. "You are in for a grand adventure!" 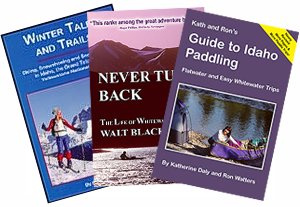 Full Review: "Pick up a copy of Winter Tales and Trails . . . . You'll not only get a complete guide and review of trails, but you will also learn about the rich, colorful history of skiing in the region. Much of Watters' writing is action: you'll catch your breath through the tales of early trailblazers. But the challenges laid by these tales is clear and you will be compelled to see for yourself the ghost towns and scenic vistas . . . . Be sure to get a copy--you are in for a grand adventure!" "Winter Tales' goes to new heights"
Full Review: "Winter Tales,' goes to new heights, offering basics and some little-known historical insights. Those interested in snowshoes won't feel left out . . . . And to add a more modern element, Watters also includes snowboarding opportunities." 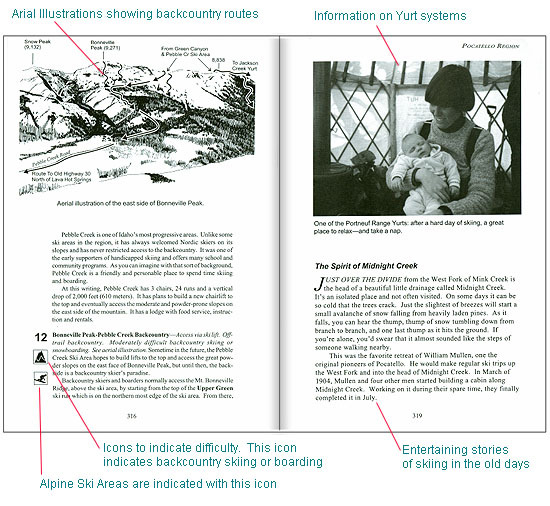 "The standard by which other winter guide books are judged." 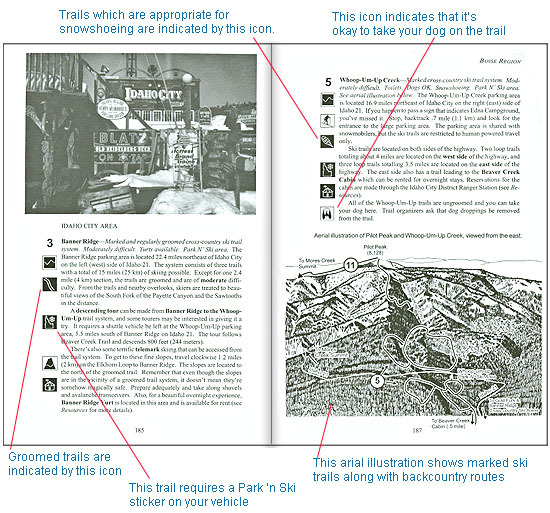 Full Review: "Buy it as a guidebook for the trail. Enjoy it as an entertaining history book at night. It's the standard by which other winter guide books are judged." 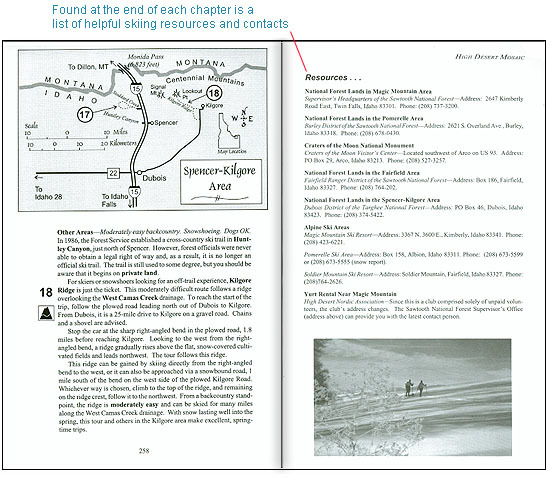 "Obviously thoroughly researched through firsthand knowledge ... easy to read maps and scenic photos." "It has a well honed sense of place, a nice appreciation for local folklore centered around the long snowshoe and a commitment to sport that is integrated with the environment." If you need the book soon, you'll want to order it from us. We are the publisher, have them in stock, and ship immediately. Amazon.com & other Internet sites do not stock the book, and it will take three or four weeks to obtain it from them. Click "Buy Now" button (below) to order on-line . 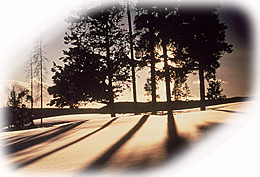 . .
OR: if you'd like to pay by check or talk to a real person, call us toll free at 208-232-6857.